We Found A New Store That Does All Leather Everything! 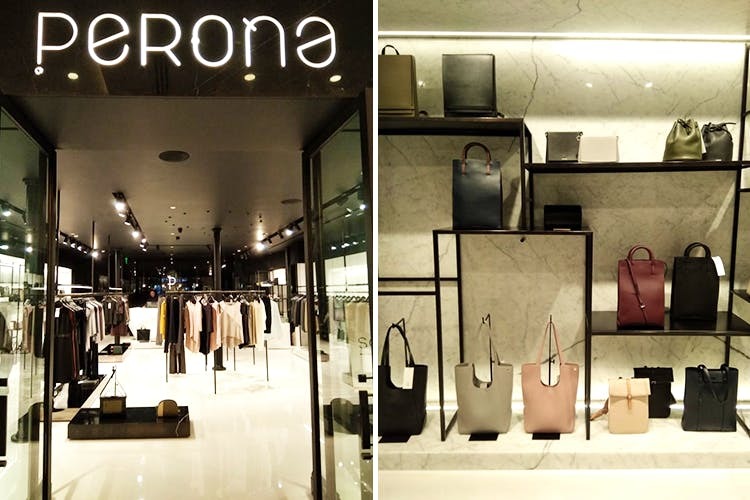 Perona, a new store at The Chanakya, is a store that does everything—wallets, dresses, tops, jumpsuits, and many types of bags—in fine leather, or with leather detailing. The store even has the scent of quality leather. They have a decently-sized space that's divided intelligently into a showcase of bags (that include messenger bags, bucket bags, totes, clutches, mini-barrel bags—you name it, they have it), womenswear and menswear. While the menswear section is not the most extraordinary (very basic, if that's your vibe), the womenswear has some stunning stuff. We were ogling the leather-top jumpsuits, the booty shorts (for the more risque of us), and the leather-trimmed dresses—goes without saying that this is all dry-clean-only. But the biggest sell is their bags. What they lack in a range of hues they make up for in a variety of styles. Their messenger bags have our heart, but their bucket bags and mini-barrel bags are also worth investing in. The leather is world-class, and the kind of quality that will see you through a number of years. We also like that they've stuck to classic, non-loud tones—think camel and chocolate browns, blush nudes and dusky roses—that will lend themselves well to pairing with everything. The range starts at roughly INR 8,000. The menswear section. It's not as 'I-want-to-buy-everything' inducing as the women's section. Invest in one of their capacious messenger bags—they convert well from work to drinks.